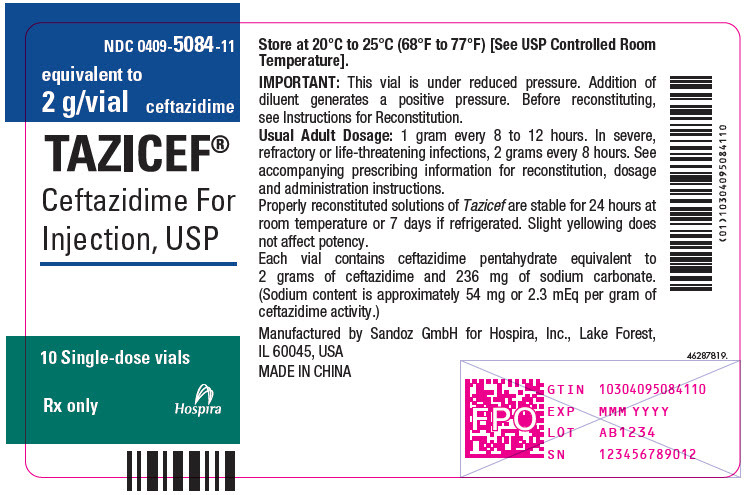 Tazicef (ceftazidime for injection, USP) is a sterile, dry-powdered mixture of ceftazidime pentahydrate and sodium carbonate. The sodium carbonate at a concentration of 118 mg/g of ceftazidime activity has been admixed to facilitate dissolution. The total sodium content of the mixture is approximately 54 mg (2.3 mEq)/g of ceftazidime activity. Tazicef in sterile crystalline form is supplied in vials equivalent to 1 g or 2 g of anhydrous ceftazidime. After IV administration of 500-mg and 1-g doses of ceftazidime over 5 minutes to normal adult male volunteers, mean peak serum concentrations of 45 and 90 mcg/mL, respectively, were achieved. After IV infusion of 500-mg, 1-g and 2-g doses of ceftazidime over 20 to 30 minutes to normal adult male volunteers, mean peak serum concentrations of 42, 69, and 170 mcg/mL, respectively, were achieved. The average serum concentrations following IV infusion of 500-mg, 1-g and 2-g doses to these volunteers over an 8-hour interval are given in Table 1. • Lower Respiratory Tract Infections, including pneumonia, caused by Pseudomonas aeruginosa and other Pseudomonas spp. ; Haemophilus influenzae, including ampicillin-resistant strains; Klebsiella spp. ; Enterobacter spp. ; Proteus mirabilis; Escherichia coli; Serratia spp. ; Citrobacter spp. ; Streptococcus pneumoniae; and Staphylococcus aureus (methicillin-susceptible strains). • Skin and Skin-Structure Infections caused by Pseudomonas aeruginosa; Klebsiella spp. ; Escherichia coli; Proteus spp., including Proteus mirabilis and indole-positive Proteus; Enterobacter spp. ; Serratia spp. ; Staphylococcus aureus (methicillin-susceptible strains); and Streptococcus pyogenes (group A beta-hemolytic streptococci). • Urinary Tract Infections, both complicated and uncomplicated, caused by Pseudomonas aeruginosa; Enterobacter spp. ; Proteus spp., including Proteus mirabilis and indole-positive Proteus; Klebsiella spp. ; and Escherichia coli. • Bacterial Septicemia caused by Pseudomonas aeruginosa, Klebsiella spp., Haemophilus influenzae, Escherichia coli, Serratia spp., Streptococcus pneumoniae, and S taphylococcus aureus (methicillin-susceptible strains). • Bone and Joint Infections caused by Pseudomonas aeruginosa, Klebsiella spp., Enterobacter spp., and Staphylococcus aureus (methicillin-susceptible strains). • Gynecologic Infections, including endometritis, pelvic cellulitis, and other infections of the female genital tract caused by Escherichia coli. • Intra-abdominal Infections, including peritonitis caused by Escherichia coli, Klebsiella spp., and Staphylococcus aureus (methicillin-susceptible strains) and polymicrobial infections caused by aerobic and anaerobic organisms and Bacteroides spp. (many strains of Bacteroides fragilis are resistant). • Central Nervous System Infections, including meningitis, caused by Haemophilus influenzae and Neisseria meningitidis. Ceftazidime has also been used successfully in a limited number of cases of meningitis due to Pseudomonas aeruginosa and Streptococcus pneumoniae. Tazicef may also be used concomitantly with other antibacterial drugs, such as aminoglycosides, vancomycin, and clindamycin; in severe and life-threatening infections; and in the immunocompromised patient. When such concomitant treatment is appropriate, prescribing information in the labeling for the other antibacterial drugs should be followed. The dose depends on the severity of the infection and the patient's condition. To reduce the development of drug-resistant bacteria and maintain the effectiveness of Tazicef (ceftazidime) and other antibacterial drugs, Tazicef (ceftazidime) should be used only to treat or prevent infections that are proven or strongly suspected to be caused by susceptible bacteria. When culture and susceptibility information are available, they should be considered in selecting or modifying antibacterial therapy. In the absence of such data, local epidemiology and susceptibility patterns may contribute to the empiric selection of therapy. BEFORE THERAPY WITH TAZICEF IS INSTITUTED, CAREFUL INQUIRY SHOULD BE MADE TO DETERMINE WHETHER THE PATIENT HAS HAD PREVIOUS HYPERSENSITIVITY REACTIONS TO CEFTAZIDIME, CEPHALOSPORINS, PENICILLINS, OR OTHER DRUGS. IF THIS PRODUCT IS TO BE GIVEN TO PENICILLIN-SENSITIVE PATIENTS, CAUTION SHOULD BE EXERCISED BECAUSE CROSS- HYPERSENSITIVITY AMONG BETA-LACTAM ANTIBACTERIAL DRUGS HAVE BEEN CLEARLY DOCUMENTED AND MAY OCCUR IN UP TO 10% OF PATIENTS WITH A HISTORY OF PENICILLIN ALLERGY. IF AN ALLERGIC REACTION TO TAZICEF OCCURS, DISCONTINUE THE DRUG. SERIOUS ACUTE HYPERSENSITIVITY REACTIONS MAY REQUIRE TREATMENT WITH EPINEPHRINE AND OTHER EMERGENCY MEASURES, INCLUDING OXYGEN, IV FLUIDS, IV ANTIHISTAMINES, CORTICOSTEROIDS, PRESSOR AMINES, AND AIRWAY MANAGEMENT, AS CLINICALLY INDICATED. As with other antibacterial drugs, prolonged use of Tazicef (ceftazidime for injection, USP) may result in overgrowth of nonsusceptible organisms. Repeated evaluation of the patient's condition is essential. Inducible type I beta-lactamase resistance has been noted with some organisms (e.g., Enterobacter spp., Pseudomonas spp., and Serratia spp.). As with other extended-spectrum beta-lactam antibacterial drugs, resistance can develop during therapy, leading to clinical failure in some cases. When treating infections caused by these organisms, periodic susceptibility testing should be performed when clinically appropriate. If patients fail to respond to monotherapy, an aminoglycoside or similar agent should be considered. Pregnancy Category B. Reproduction studies have been performed in mice and rats at doses up to 40 times the human dose and have revealed no evidence of impaired fertility or harm to the fetus due to TAZICEF. There are, however, no adequate and well-controlled studies in pregnant women. Because animal reproduction studies are not always predictive of human response, this drug should be used during pregnancy only if clearly needed. Ceftazidime is excreted in human milk in low concentrations. Caution should be exercised when TAZICEF is administered to a nursing woman. Central Nervous System Reactions (fewer than 1%) included headache, dizziness, and paresthesia. Seizures have been reported with several cephalosporins, including ceftazidime. In addition, encephalopathy, coma, asterixis, neuromuscular excitability, and myoclonia have been reported in renally impaired patients treated with unadjusted dosing regimens of ceftazidime (see PRECAUTIONS: General). Laboratory Test Changes noted during clinical trials with Tazicef (ceftazidime for injection, USP) were transient and included: eosinophilia (1 in 13), positive Coombs test without hemolysis (1 in 23), thrombocytosis (1 in 45), and slight elevations in one or more of the hepatic enzymes, aspartate aminotransferase (AST, SGOT) (1 in 16), alanine aminotransferase (ALT, SGPT) (1 in 15), LDH (1 in 18), GGT (1 in 19), and alkaline phosphatase (1 in 23). As with some other cephalosporins, transient elevations of blood urea, blood urea nitrogen, and/or serum creatinine were observed occasionally. Transient leukopenia, neutropenia, agranulocytosis, thrombocytopenia, and lymphocytosis were seen very rarely. • Although clinical improvement has been shown, bacteriologic cures cannot be expected in patients with chronic respiratory disease and cystic fibrosis. • The higher dose should be reserved for immunocompromised pediatric patients or pediatric patients with cystic fibrosis or meningitis. Ceftazidime is excreted by the kidneys, almost exclusively by glomerular filtration. Therefore, in patients with impaired renal function (glomerular filtration rate [GFR] <50 mL/min), it is recommended that the dosage of ceftazidime be reduced to compensate for its slower excretion. In patients with suspected renal insufficiency, an initial loading dose of 1 gram of ceftazidime may be given. An estimate of GFR should be made to determine the appropriate maintenance dosage. The recommended dosage is presented in Table 4. Note: Generally Tazicef should be continued for 2 days after the signs and symptoms of infection have disappeared, but in complicated infections longer therapy may be required. Tazicef may be given intravenously or by deep IM injection into a large muscle mass such as the upper outer quadrant of the gluteus maximus or lateral part of the thigh. Intra-arterial administration should be avoided (see PRECAUTIONS). For IM administration, Tazicef should be constituted with one of the following diluents: Sterile Water for Injection, Bacteriostatic Water for Injection, or 0.5% or 1% Lidocaine Hydrochloride Injection. Refer to Table 5. For direct intermittent IV administration, constitute Tazicef as directed in Table 5 with Sterile Water for Injection. Slowly inject directly into the vein over a period of 3 to 5 minutes or give through the tubing of an administration set while the patient is also receiving one of the compatible IV fluids (see COMPATIBILITY AND STABILITY). For IV infusion, constitute the 1-gram or 2-gram vial and add an appropriate quantity of the resulting solution to an IV container with one of the compatible IV fluids listed under the COMPATIBILITY AND STABILITY section. Freezing solutions of ceftazidime for injection is not recommended. All vials of Tazicef as supplied are under reduced pressure. When Tazicef is dissolved, carbon dioxide is released and a positive pressure develops. For ease of use please follow the recommended techniques of constitution described on the detachable Instructions for Constitution section of this insert. Tazicef (ceftazidime for injection, USP) when constituted as directed with Sterile Water for Injection, Bacteriostatic Water for Injection, or 0.5% or 1% Lidocaine Hydrochloride Injection, maintains satisfactory potency for 24 hours at room temperature or for 7 days under refrigeration. Solutions in Sterile Water for Injection that are frozen immediately after constitution in the original container are stable for 3 months when stored at -20°C. Once thawed, solutions should not be refrozen. Thawed solutions may be stored for up to 8 hours at room temperature or for 4 days in a refrigerator. Tazicef (ceftazidime for injection, USP) when constituted as directed with Sterile Water for Injection, maintains satisfactory potency for 24 hours at room temperature or for 7 days under refrigeration. Solutions in Sterile Water for Injection in the original container or in 0.9% Sodium Chloride Injection in VIAFLEX® small-volume containers that are frozen immediately after constitution are stable for 3 months when stored at -20°C. Do not force thaw by immersion in water baths or by microwave irradiation. Once thawed, solutions should not be refrozen. Thawed solutions may be stored for up to 24 hours at room temperature or for 7 days in a refrigerator. More concentrated solutions in Sterile Water for Injection in the original container that are frozen immediately after constitution are stable for 3 months when stored at -20°C. Once thawed, solutions should not be refrozen. Thawed solutions may be stored for up to 8 hours at room temperature or for 4 days in a refrigerator. Tazicef is compatible with the more commonly used IV infusion fluids. Solutions at concentrations between 1 and 40 mg/mL in 0.9% Sodium Chloride Injection; 1/6 M Sodium Lactate Injection; 5% Dextrose Injection; 5% Dextrose and 0.225% Sodium Chloride Injection; 5% Dextrose and 0.45% Sodium Chloride Injection; 5% Dextrose and 0.9% Sodium Chloride Injection; 10% Dextrose Injection; Ringer's Injection, USP; Lactated Ringer's Injection, USP; 10% Invert Sugar in Water for Injection; and NORMOSOL®-M in 5% Dextrose Injection may be stored for up to 24 hours at room temperature or for 7 days if refrigerated. Tazicef is less stable in Sodium Bicarbonate Injection than in other IV fluids. It is not recommended as a diluent. Solutions of Tazicef in 5% Dextrose Injection and 0.9% Sodium Chloride Injection are stable for at least 6 hours at room temperature in plastic tubing, drip chambers, and volume control devices of common IV infusion sets. Ceftazidime at a concentration of 4 mg/mL has been found compatible for 24 hours at room temperature or for 7 days under refrigeration in 0.9% Sodium Chloride Injection or 5% Dextrose Injection when admixed with: cefuroxime sodium (ZINACEF®) 3 mg/mL, heparin 10 or 50 U/mL or potassium chloride 10 or 40 mEq/L. As with other cephalosporins, Tazicef powder, as well as solutions, tend to darken depending on storage conditions; within the stated recommendations, however, product potency is not adversely affected. Pharmacy Bulk Package Bottles: equivalent to 6 grams of ceftazidime. 1. Cockcroft DW, Gault MH. Prediction of creatinine clearance from serum creatinine. Nephron. 1976;16:31â€“41. ZINACEF® is a registered trademark of Teligent, Inc. Note: As with the administration of all parenteral products, accumulated gases should be expressed from the syringe immediately before injection of Tazicef. 2 grams of ceftazidime and 236 mg of sodium carbonate.